Marlon Mack can rely on a potentially stronger supporting cast for help. WESTFIELD, Ind. — Marlon Mack spent his rookie season serving as the understudy to one of pro football’s greatest rushers. This year, he’s playing the lead in Indianapolis. 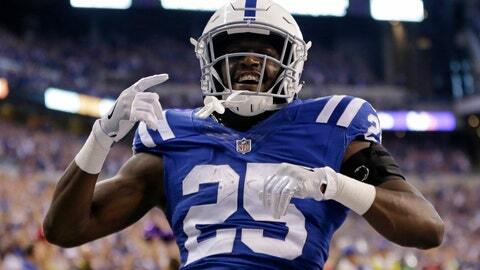 The 22-year-old running back got his big break when the Colts let 35-year-old Frank Gore walk away in free agency, handed Mack the starting job and offered him the chance to become a star on football’s biggest stage. It’s up to Mack to prove he can live up to the billing. “You’ve just got to go out there and make a play every chance you get,” Mack said. In college, he set the American Athletic Conference’s freshman rushing record with 1,041 yards, followed his conference rookie of the year season with a school-record 1,381 yards in 2015 and finished his career as South Florida’s career leader in yards rushing (3,609) and touchdown runs (32). He was the first player in school history to earn three straight all-conference selections and the first to post three consecutive 1,000-yard seasons. Mack’s resume coupled with the rave reviews from his coaches helped persuade Colts general manager Chris Ballard to draft Mack in the fourth round. He didn’t disappoint in Indy, either. His results made Ballard decide not to re-sign the league’s fifth-leading rusher and to transition to a guy who learned plenty from Gore. Veteran Robert Turbin has been a successful short-yardage specialist for the Colts even though he missed 10 games last year with a dislocated left elbow. Turbin may be used differently when he returns from a four-game suspension for violating the league’s substance-abuse policy. While Turbin sits, Christine Michael may provide the experienced voice. He’s trying to earn a roster spot on his fifth team in six years as he recovers from an undisclosed season-ending injury. Fifth-round pick Jordan Wilkins is bigger, 6-foot-1 and 216 pounds, and has been so impressive at camp that Reich singled out Wilkins on Wednesday, acknowledging he’s been better than hype. Reich thinks it’s a perfect script to challenge defenses. What the roster lacks is a proven workhorse. Gore logged more carries during his three seasons in Indy (784) than the Colts’ six backs at camp have combined (714). NOTES: The Colts activated left tackle Anthony Castonzo (hamstring) from the non-football injury list — just in time for the most physical practice of camp. Reich said afterward that practice would continue to have live hitting throughout the remaining 2 weeks in Westfield, a northern suburb of Indianapolis. … It took Andrew Luck one week to get his timing down with Pro Bowl receiver T.Y. Hilton. How did it happen so quickly? “It’s like when you wake up and brush your teeth, it’s easy for us, man,” Hilton said.